Having climbed in Mantras, Cobras, Vipers, and Venoms; I was excited to review this new slipper. 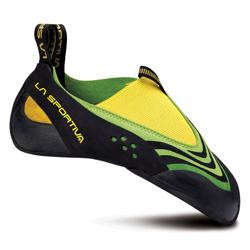 The Speedster is the newest slipper addition to La Sportiva’s already expansive product line. With the Mantras, Venoms, and Vipers discontinued, the Speedster and the reintroduced Cobra are the current offerings in this genre. The Speedster is unique in that the midsole consists solely of a 3mm piece of XS Grip 2 rubber which extends from the toe to the heel; creating a wrapping effect (the edges are round). With the P3 technology tied into the figure-eight sling-shot rand, the shoe remains aggressively downturned, holding its shape. I was surprised that I wore the same size in the Speedster as my Solutions and Testarossas (I had to go down 1.5 additional sizes in the Cobra to accommodate the stretching). Speedsters don’t stretch nearly as much as the Cobra due the leather and synthetic combination. Performance wise, this is a highly-specialized shoe for steep rock/plastic, or as a light-weight training shoe. Micro-edging clearly is difficult, and I would assume heavier climbers would have difficulties with such a soft shoe. Sensitivity and power are unmatched in this shoe – as you can feel and “grab” holds. The real standout between the Cobra and Speedster is the heel hooking. The Speedsters feel much more secure on tenuous heel hooks due to the P3/PD85 construction and aggressive fit. Steep sport, bouldering, and plastic are the Speeders sweet spot. It’s a great second shoe to toss in the pack when heading to the crag or gym. Overall, the Speedster is a great training shoe or stand alone excelling on steep cave-oriented climbing or bouldering. I liked the shoe a lot more on BRC’s Tsunami Wall than the local techy climbing found in Boulder Canyon or at Flagstaff. I like the innovation in sports shoes to be changing, these I will take for cycling.